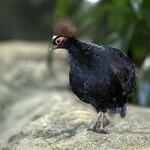 The crested wood partridge is a dimorphic species, meaning males and females differ in appearance. Males have bluish-purple feathers as well as a large red crest on the head, which gives the species its name. Females have green feathers and lack a crest. 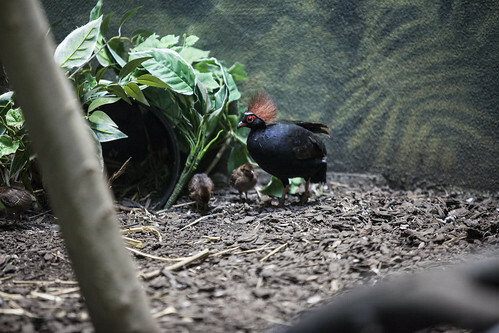 The crested wood partridge uses its feet to probe for insects, seeds and fruits on the forest floor. 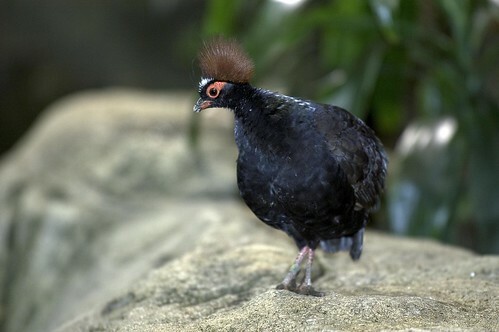 The crested wood partridge can live in groups of up to 15 individuals. Breeding pairs dig tunnel-like nests beneath the litter of the forest floor. 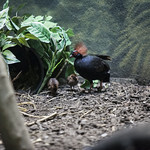 Offspring can number from four-eight chicks, which are cared for cooperatively by each parent. Larger broods may be divided, with each parent caring exclusively for half. Parents feed chicks for the first week, after which chicks forage for their own food.